When I sat down with ArcStone's creative director, Jess Louwagie, to discuss web design trends of 2017, I also uncovered some notable ways ArcStone's design team goes about our website redesigns. 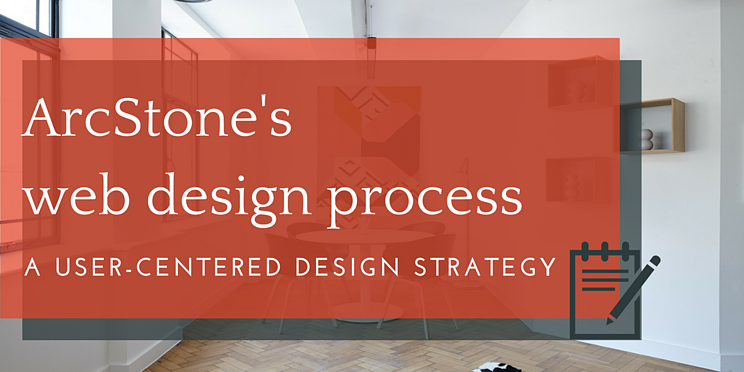 Whether you're planning a site design with ArcStone or you're a designer in search of new ideas, I hope these thoughts from Jess can provide some inspiration and support as you plan your web design project strategy. 1. More than half the world’s population will be online in 2017 – this includes an aging population and many digital novices. How will our UX and design team address those challenges? "We typically approach projects by first getting the clients account of what’s working and what’s not working, and then establish goals for their site. We next examine analytics as deeply as possible to identify positive and negative trends, and determine what needs to be done to fix areas of failure." *Note this process is often referred to as failure-mapping as described in question 2. "Next we develop personas around the clients target markets, and establish conversion objectives for each. This process kicks off our user-centered design process where all design decisions are based on engaging each of these personas, and creating pathways for them to take action." "Failure mapping involves analyzing a website or application for areas of failure. This can depend on the purpose of the site or application, but generally speaking it often means, where users/visitors are not engaging or taking a desired action." 3. How can a business with a widespread audience meet age-responsive design? *Examples of age-responsive design include: larger fonts and/or increased contrast for the elderly, or bright vibrant colors and simplified interfaces for sites geared for young children. "It’s generally a good rule to design to the lowest common denominator in terms of physical ability, emotional ability, or intellectual level. Whether elderly or youth, a designer should consider these factors and tailor the experience to work for either (if they are both audiences). It comes back to user-centered design, and creating an experience that is unique to specific audience needs. This also relates to devices and how design adapt to these different formats. The best design is not seen." 4. What are some of your biggest "no-no's" when it comes to a website design or redesign? "Autoplay audio and video. Competing colors, visual vibration caused by poor color choices (like colored text on colored backgrounds), and the still lingering but less common splash screens, and flash animation." 5. How can companies know if a redesign is worth their time and budget vs. just intermittent site tweaks? "It depends on how old their site is and whether it is functionally sound, or just visually lacking. If a sites design or structure prevents it from being accessed on a range of devices or sizes, that's a problem that needs to be addressed if they expect to compete." 6. Does ArcStone have any hopes of changing tools or processes they use as we take on 2017? "We are constantly looking for ways to be more efficient and effective with how we design and develop sites. Wireframes are a great example. What used to be static wireframes in PDF format have shifted to interactive wireframes or sometimes prototypes to convey behavior and interactivity (which can be equally as important as visual design). Best of all, the tools we use allow for client feedback within the context of the wireframe in the form of comments and responses. We even can use integrated user testing right within the wireframe."